Today was a great day. 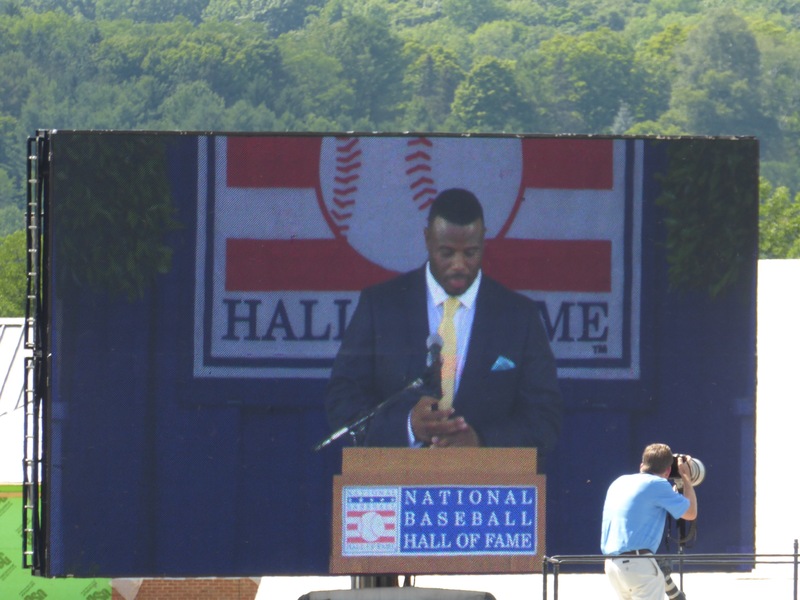 The first player ever to go into the Hall as a Mariner, George Kenneth Griffey, Jr., was inducted today. 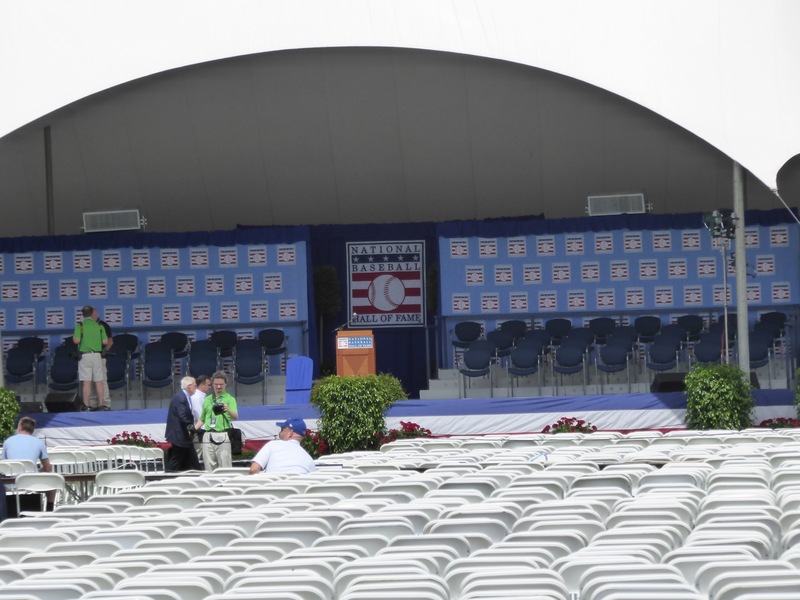 This induction ceremony was what got me thinking about a cross-country baseball tour. I saw Junior play as a rookie and could tell then he was going to be good, but of course had no idea just how good. I followed his career with great interest through his years in Seattle and beyond. 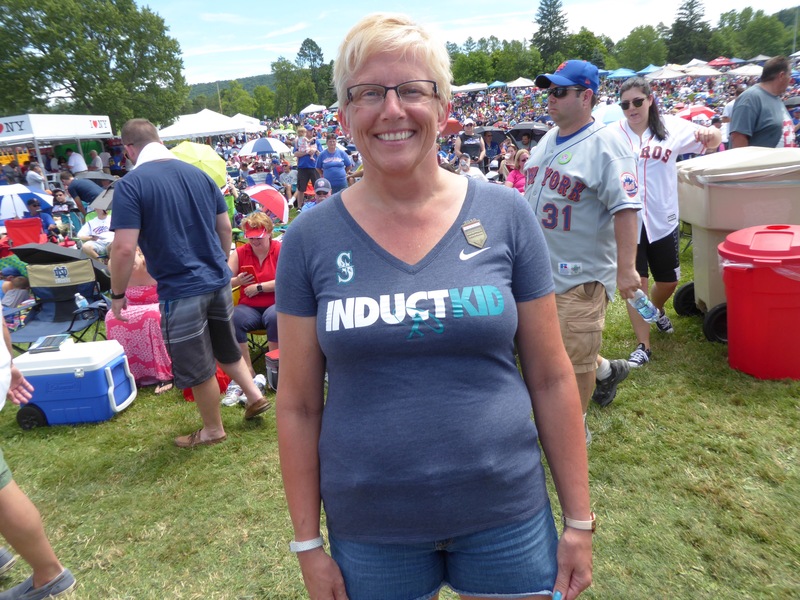 Though I had been to the Hall several times before, I’d never attended an induction ceremony and the more I thought about it and about taking in games at all levels both going and coming, the more it seemed like I was obligated to go. So we arrived three hours early for the 1:30 ceremony and that still wasn’t good enough to get seats anywhere near the stage. We were graciously squired to the field on the edge of Cooperstown by a local friend (so we didn’t have to pay the parking charges of up to $50), and we were able to set our chairs on the flat area (the gentle rise way back was already covered). The crowd was ultimately estimated at about 50,000. We could see the large screen, but not the podium, and we couldn’t get near enough for pictures of the actual people. This panorama doesn’t capture the size of the field or the crowd. Here’s a picture of the stage before the reserved seats were occupied. Interestingly, the Clark family owns the land on which the Hall is located and also owns some 10,000 acres in and around Cooperstown. Jane Forbes Clark is the chairman of the Hall and is the last in the Clark line that started and has run it from the beginning. She presided over the ceremony and is pictured with the inductees below. 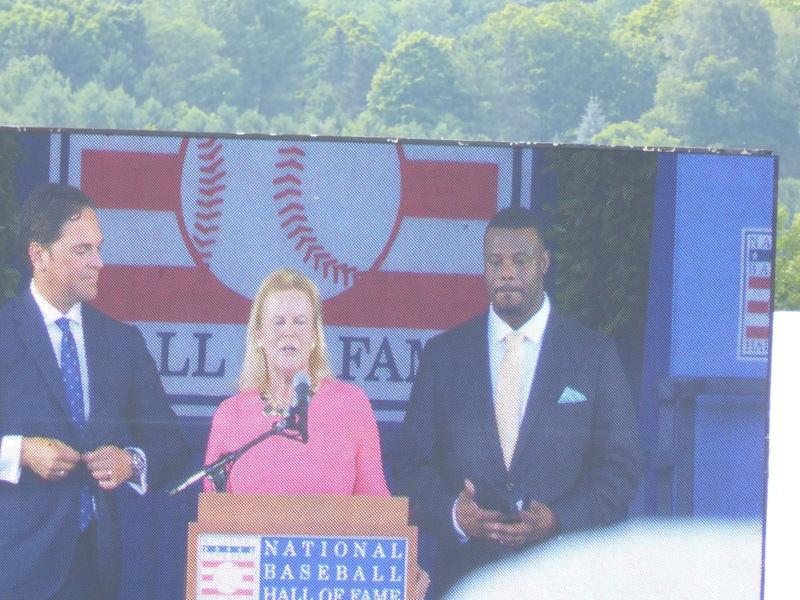 Jane Forbes Clark with Mike Piazza and Ken Griffey Jr.
Back to the crowd. It was mellow. My guess is that about 60% were Mets fans there to cheer Mike Piazza, the other inductee and 40% were Mariners fans. Frankly, that surprised me because Seattle is clear across the country and New York City is relatively close, so I expected far fewer M’s loyalists. But Junior is the first Mariner in the Hall and is one of the most beloved players of his time and that vibe was evident. I thought it was interesting that Griffey is the highest draft pick (No. 1) to go into the Hall and Piazza the lowest (No. 1390). 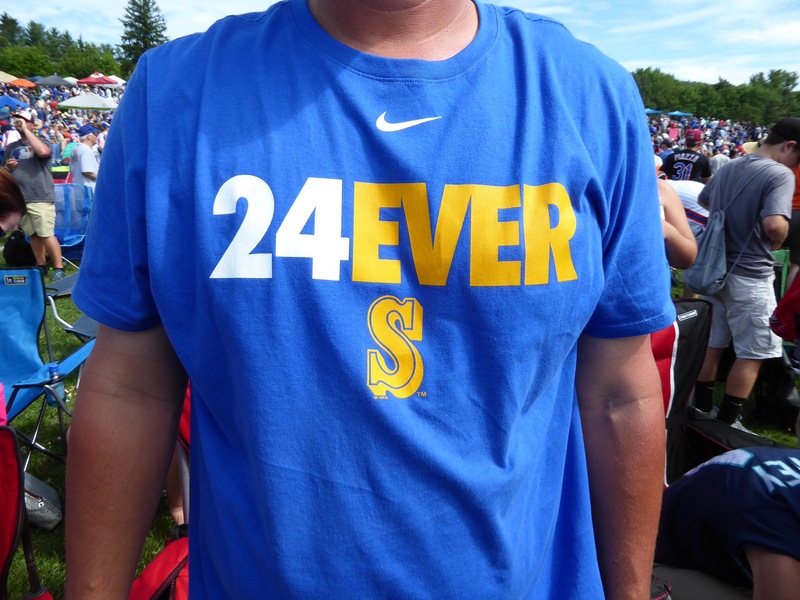 Here are a couple of good Griffey shirts, too. For at least one (see picture below), this was not the first. Others, like the couple we sat next to, were from other parts of the country (in this case Wisconsin) but just liked Griffey. The acceptance speeches were heartfelt and emotional, each paying tribute to family, teammates, coaches and mentors. Despite the fact that he essentially grew up in the ball park, Griffey made a point of thanking the many players who mentored him when he made it to the Show at age 19 and in the early years of his career. He concluded his speech by putting on a Mariners cap backwards, in his trademark style. There was a tape of Lou Pinella, Griffey’s manager in Seattle, talking about what a great player he was but also telling the story of Junior paying off a bet. It seems they had a running wager having to do with Junior hitting balls out to specific spots during batting practice, and, because he had lost and thus owed Lou a steak dinner, he paid off in a special way. He somehow managed to get a live cow into Pinella’s office! He simply asked how Lou wanted it cut. 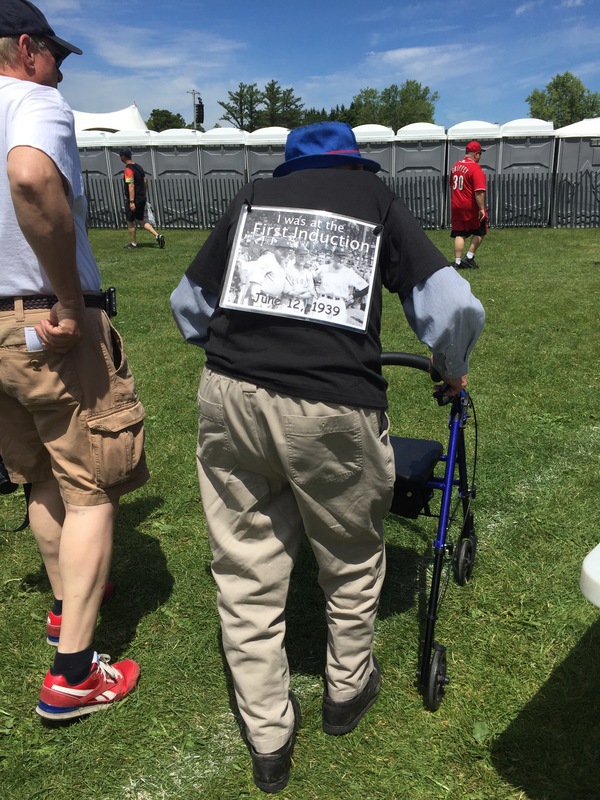 The weather was warm, but not stifling, and with lots of sunscreen and water, we survived just fine. It would have been nice to be closer (admission is free), but the crowd was terrific and everyone, it seemed, had a story. I may never do it again, but I’m glad I did it today.